Why do we take OPG xrays? This takes a view of the upper and lower jaw bones, teeth, jaw joints, sinuses, nasal area and cheek bones. 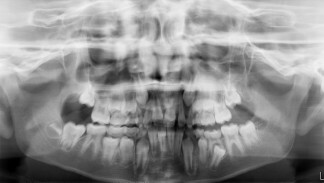 The position of wisdom teeth can be readily seen, especially the lower teeth proximity to the mandibular nerve canal. 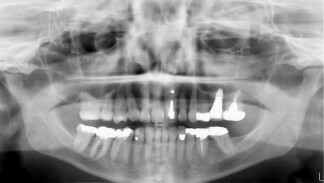 This canal appears as two white parallel lines running within the lower jaw. (See Oral & Gum surgery and also Risks in removal of wisdom teeth). The OPG is more of an overall image rather than a close up view that the above xrays achieve. However, sensors used for the bitewing and periapicals only cover a smaller area and can be awkward to place in some areas of the mouth. Some people have sensitive mouths that cause them to gag. An OPG may the only way to capture information about their mouths. Infections, tumours, sinus problems, jaw joint defects, broken or cracked bones can also be observed. Overall view of treatments to teeth such as dental implants, root canal treatment, crowns and bridges. Level of bone around all the teeth to help assess the amount of gum problems. Missing or unerupted teeth can be seen in one image. Children’s dentistry can be helped with an OPG to view the development of the new teeth under their baby teeth. This may help to make an orthodontic assessment or to observe other problems. 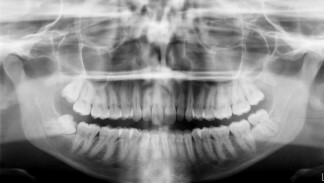 The next dental blog will go into how often are xrays taken and the important reasons behind this. OPG with lower 3rd molars roots on the mandibular nerve canal. OPG showing an implant, root fillings, post inside root (upper central tooth) and crowns. OPG showing developing teeth in the jaw bones.